Remove NSF security tool is efficient in unlocking the Local access protection of Lotus Notes NSF file. This software make user to access restricted .nsf file. Well designed Remove NSF security Tool holds the accuracy of restricted NSF file content. While removing Local access protection it maintains 100% accuracy. No need to think about NSF file size limitation while unlocking the protected NSF files. 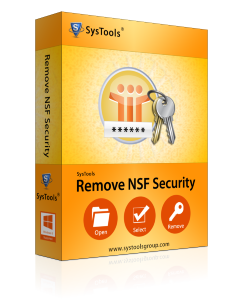 Without putting any limitation in unlocking, software remove NSF security. Local Access Remover Software is widely used to remove Local Access Protection of Lotus Notes NSF files. Tool authorized the user to access the restricted NSF file. Remove Local NSF Security is a standalone application as this tool does not require having technical expertise in Lotus Notes Email client. It Offers Simple GUI for novice & technical Users. This NSF Security Remover Software is totally a Windows based application. Remove Local Access Protection tool works well on all Windows OS even Win 8. Remove Local NSF database security Without Hampering the original Data. Software removes the local security setting showing errors such as “You are not authorized to access that database”. No File Size Limitation While removing Local Access Protection. Provide Easy & Simple User Interface. Free Trial Edition of Product allow users to Remove Local Restriction from Supplied Lotus Notes NSF File. Is tool removed "The database has a local access protection and you are not authorized to access it" error? No , Securase Software helps user to get rid from Restricted Lotus Notes NSF protection. It does not decrypt encrypted NSF files. Does Securase require Lotus Notes Installation? Yes, Software require properly installed and configure Lotus Notes Email client. Is there any specific File Size Limitation in this software? No there is no file size limitation in this software users can load any size of NSF file for unlocking process. Does this software remove NSF Encryption? No, Remove NSF Security is beneficial to remove only Local ACL encryption of Lotus Notes NSF File. This tool is fantastic in removing Local access protection of Lotus Notes .nsf file. Its helps me to access my locked NSF file without facing any error or damage in content. Only one word to say about this Software SUPERB!! My heartiest thanks to the entire team of Lotus Notes NSF Security Remover which provide access to restricted NSF files. During the process or unlocking the local protection I do not face any kind of issue and damage Thanks to All. My views for Remove NSF Security tool are excellent as this software makes smile on my face after unlocking my restricted NSF data. The interface of this utility is very simple as novice users can easily operate it without any issue. What I like in this software is It makes to access the Local Access protected NSF file. Without any damage or changes in the original data content software gives healthy data to me after removing the limitations.